Gunship take you on a nostalgic trip through 1980s pop culture with Dark All Day. This synthpop album will have you digging through the closet for your favorite old pair of high-waisted jeans by the end. The world is currently infatuated with nostalgia. This can be both a good and a bad thing, depending on your personal perspective. Shows like Netflix‘s Stranger Things have been highly praised by critics for how reminiscent of the time period they are. As far as music goes, synthwave has had a very strong resurgence in the last few years. Vaporwave is also a very new thing that hits the nostalgia factor even harder. Dark All Day, while not being vaporwave, hits home harder than anything yet in my opinion to throw listeners back to 1985. Ripe with a number of synths, live percussion, and guitar, Gunship create a very energetic and unique sound. The dark and warm synth harmonies and drum tones trigger a response that instantly makes me think of Ridley Scott‘s Blade Runner. This album is an open love letter to all things beloved of that time period. I wasn’t even born until the 90s, but Dark All Day makes me long for a time before I was born. It is honestly the first time I have ever felt anemoia. It is a real treat to experience. 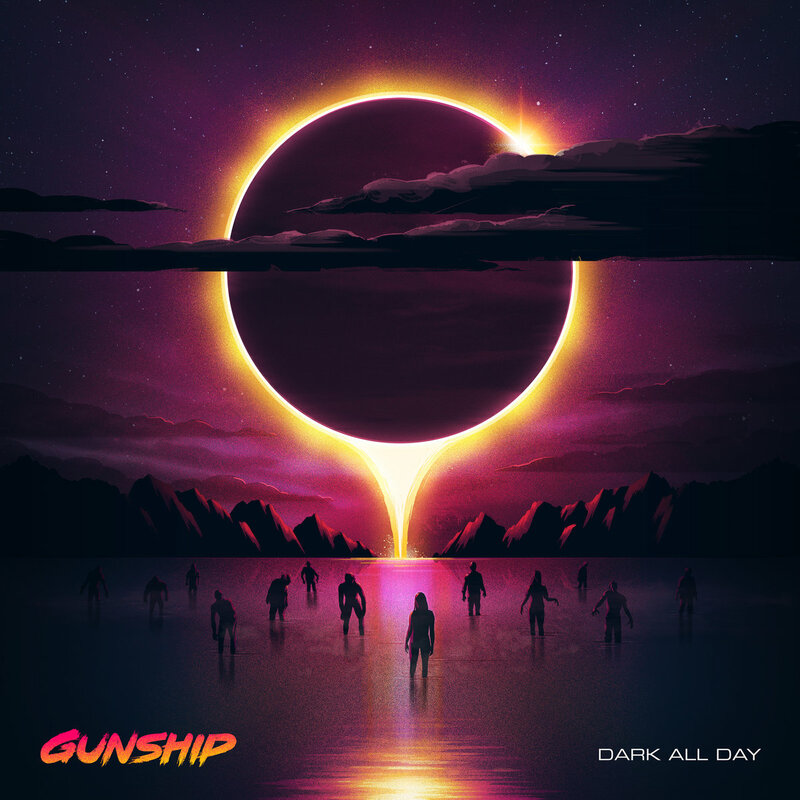 Gunship achieve such a heavy sense of nostalgia and longing both through their sound, but also through lyrics and themes. The title track, “Dark All Day”, is written about The Lost Boys, the critically acclaimed film by Joel Schumacher. This song even features Tim Cappello, reprising his role from the film as the macho, oiled up saxophonist. His solo featured in this song is up there for my favorite moments in the year for music. Cappello‘s playing in general is fantastic, but that is to be expected with him. “When You Grow Up Your Heart Dies” is another song paying homage to an iconic film, referring to the iconic line from The Breakfast Club. Not every song on the album is a movie reference, or even a reference to the 80s. Gunship show their sci-fi love with the opening track “Woken Furies”. This song is written about Altered Carbon, the 2002 novel by Richard Morgan. My personal favorite song, “Art3mis and Parzival”, is about Ernest Cline‘s Ready Player One. This song, like so many others on the album, has an incredible chorus that will get stuck in your head for days. They are catchy and quite a few are incredibly memorable. Alex Westaway delivers absolutely incredible vocals throughout the album. They may be my favorite thing about the album besides the sweet, sweet sax of Cappello. I am sure my coworkers are tired of me humming his vocal melodies while I work, but I cannot help myself. They are just that good. The only song on the album I don’t personally care for is a cover of “Time After Time”, the classic by Cyndi Lauper. My dislike for it is not because it is a bad cover, more so that I don’t care much for the song in their particular style. Dark All Day is an incredibly fun and catchy album with a million and one throwbacks to some of the best parts of the 1980s. The sounds go from dark and broody to upbeat and poppy, all led by Westaway’s dynamic range of synthesizers. If you have a fondness 80s pop culture, this is absolutely a must-listen album for you. There is a very strong chance this goes down as my personal favorite release of 2018. Be sure to let us know what you think of Dark All Day!